Crop Tops offers the diversity and convenience of individual care along with being able to be setup in any soil or location. Our product is 95% recyclable and designed with a quick button pin assembly, stainless steel ground spike (that doesn't rust,) telescoping pole,(that grows with plant), a snap-on skirt(completes the storm protection) and a nylon chord anchor system that keeps skirt in place during extreme weather. Protect ALL forms of plants you can imagine. From vegetables, fruits, trees, herbs and aesthetics, your plants will be conveniently protected instantly from frost, winds, over-watering, caterpillars, powdery mildew, unwanted pollination and many other harmful elements. Velcro hood vents to reduce condensation, which reduces the risk of botrytis, fuschanom, powder mildew, caterpillars and rot. 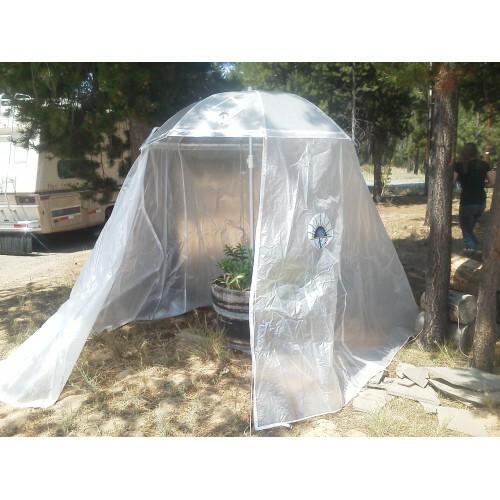 Crop Top can also be used as an instant quarantine in or out of greenhouses to provide a more efficient area to apply organic pesticides and herbicides. -Keep those nasty pests imprisoned! No more need for an expensive greenhouse setup that uses unnecessary energy or bringing your plants in and out constantly. Your plants will thrive and you can enjoy them in their natural environment all times of the year. Our unique, one person, easy-up design provides green house quality UV and storm protection wi..